Does the word "raft" have a slightly fishy ring to it, reminding you of a handful of soaked, randomly tied-together beams that have been pushed onto the water and must me made to move forward with some kind of a stick? This couldn't be farther from the truth when our rafts are concerned. Our rafting trips are just as adventurous as sailing on traditional wooden rafts but the nature of the adventure is completely different, almost as if originating from another dimension. The spacious and comfortable rafts have sturdy and reliable motors and can take you to great distances. Once you're sitting behind the wheel of one of our rafts on the waters of the Emajõe Suursoo Bog (and you can rest assured that as an adventurer you'll be allowed to do just that) you might soon feel as if you were sailing the Amazon. The seemingly endless bog landscape, the calm river stream, peculiar voices of the wild that are just as thrilling as the sounds of the jungle and, on top of it all, a warm and cosy camp site at the Raft House...What could be more rewarding? Period: April – late October. That is, when rivers and lakes are completely ice-free. Number of participants: 8 - 40. Location: Most of the trips take place in the lower reaches of Emajõgi River and on the rivers and lakes of Greater Emajõgi Bog on the eastern border of Estonia and the EU. It is one of our most unique and most popular adventures. The area where we hold our rafting trips is almost completely unpopulated and offers very distinctive natural beauty. The rafts are rather large and comfortable, with shallow draught and improved stability for river navigation. Rafts are equipped with 15 hp SUZUKI motors as manpower alone is insufficient for our long-range discoveries. Description of a rafting trip: The event is suitable for nature-lovers or, for example, a stylish and adventurous birthday party. The adventure lasts about 24 hours. Our raft port is located in Kavastu, Tartu County, where we will provide snacks and rafting and safety guidance at arrival, followed by loading your equipment onto the rafts. The number of rafts depends on the size of your party. After getting into life jackets, we will set off downstream. You will steer your own rafts. Each person capable of driving a car will be able to do that. Our first stop will be at the riverside Emajõe Suursoo Bogland Reserve visitors' centre. This will provide an overview of the area's nature and history. The following part will be more exciting, as our tripleader will leave your company behind, taking a faster boat to make preparations for your arrival at the Raft House. You will continue downstream towards Praaga at your own pace. Praaga village is located on islets at the estuary of Emajõgi and is accessible by boat only. Something of an Estonian Venice… From here, your trip will continue to lake Peipsi. You will raft about 5 km southwards on the lake and then turn into Kalli river. After three more kilometres, you will reach the Raft House. 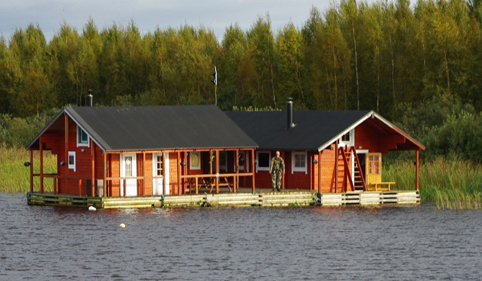 The complex has a dining and party room, sauna and two dormitories. Canoes and a rowboat are available for sightseeing. The following will be business as usual - sauna, dinner, party and good night. We will serve coffee and pancakes in the morning, followed by a trip back to Kavastu. Fears and doubts: Many potential rafters tend to have unfounded fears or doubts with regard to water trips. Some people skip rafting trips because they cannot swim well enough. However, our trips have not much to do with your swimming ability or lack thereof, just like ocean cruises don't. It's true that canoes can sometimes be tricky, but our rafting vessels are large, wide and perfectly stable. The laws of nature will not allow a raft to capsize, ever. Rafts have appropriate safety rails, so falling overboard is only possible if you are fully determined to do so. Then it's called jumping. It won't ever happen accidentally. And you'd still be wearing a life jacket. Your best safety measure at water trips is to stay sober. According to Estonian law, watercraft operators are allowed to have a moderate blood alcohol content (up to 0,8 per mill), but that is not obligatory. Most water-related accidents are due to excess drinking.